Tullibardine distillery has announced the release of the latest expression to join its range of Highland single malt whiskies, which has been finished in the finest French Chateauneuf-du-Pape wine casks. 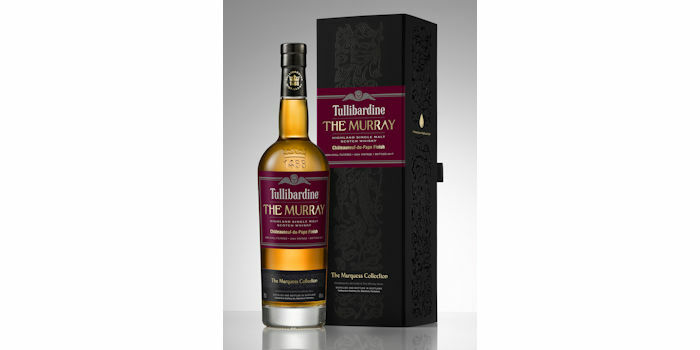 A much anticipated sequel to the triple award-winning expression, The Murray (2004), The Murray Chateauneuf-du-Pape was distilled in 2004 and bottled this year at 46 per cent volume. After initially maturing in first-fill bourbon hogshead barrels, the new release has been re-casked in French red wine barriques from the southern Rhône vineyards. The vintage single malt is russet in colour with an assortment of spicy and sweet aromas on the nose, bursting with flavours of juicy cherries and mint chocolate on the finish. The delicate red wine influence builds upon The Murray’s flavour and aroma, boasting red fruits, warm spices and a herbaceous aroma.